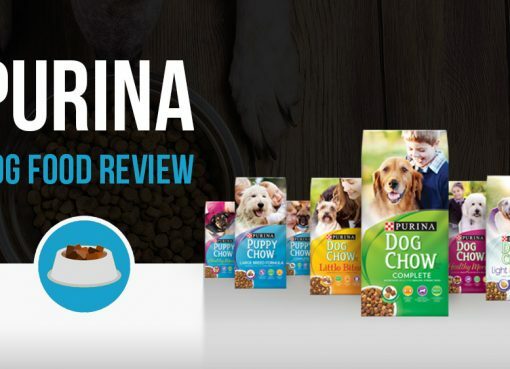 When most people get their first dog, they remember to buy all of the essentials, like collars, leashes, bowls, and food. What they often don’t remember, however, is to buy their new family member a nice comfy dog bed. But dog beds are an incredibly important addition to your home and are a must for anyone who is planning to purchase a dog. 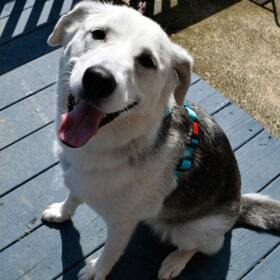 So read on, and see why these are so important to providing your dog with a good, happy life. There are dozens of great, high quality beds out there on the market today, and we definitely encourage all pet parents to go out and test beds for themselves to see which ones they thing will suit their needs best. For those who might want a little advice, however, have no fear! We were recently at the Global Pet Expo and got to check out the latest and greatest dog bed manufacturers! Here’s a list of the coolest dog bed brands we ran across. The Katherine Elizabeth pet bed is one of the best donut shaped beds that money can buy. The shape of the bed allows your bed to feel safe and protected, while still having an easy way to enter or exit, the shredded Visco elastic filling provides orthopedic support, and the furniture quality frame transforms the bed into a décor piece. And not just that, but the bed case is removable and washable, and the elevated design ensures that your four-legged friend is never touching the ground, keeping them off the hard floor and at a good, comfortable temperature year round. If your dogs are like mine, they often like to hang their head/neck over the edge of the bed – it looks painful! The curved top pillow is my favorite thing about the KE beds as a result, they offer great support and comfort for dogs who seem to love a good pillow. 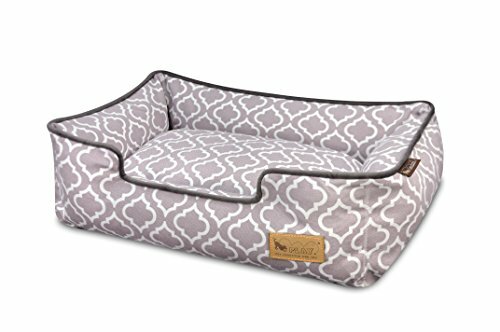 It’s not just my opinion that these beds are great for your dog’s health, though – these beds are actually veterinarian approved. Check out the video below telling the story of Katherine’s dog, Cody, and a veterinarian explaining the health benefits of this dog bed design. You can view all the available Katherine Elizabeth bed designs in their shop. One things certain about Sit Stay Go dog beds – you can’t miss them! These prints have a very bold, bohemian feel to them that look like works of art. The Mandala design looks really cool, especially on the round dog beds as pictured here. If these colors are a little too bold for you, they also have black and white designs that would fit in most any spaces. This technicolored bed is the ultimate pet pillow bed on the market today. Not only is it filled with a super comfy 100% polyester fiberfill insert, but it also has a removal, washable cotton cover and a unique pattern that will make it into a conversation piece in its own right. And not only is it a little work of art, but it also has a handy storage pocket too, so you can stash all of your pet’s toys right there were he sleeps. He’ll never need to wake up wondering where his favorite toys are again! One cool thing about the round Technicolored dog beds is they have a nice slope down to the center which I think most dogs would find comforting as it allows the rest of the dog bed to feel like it’s hugging them! Check out the full line of Sit Stay Go dog beds here. Arlee Pet makes a wide variety of crate mats and dog beds, almost any style of design you can imagine. Want a dog bed that looks like a sofa? Check out the Murphy Lounger above! What dog wouldn’t love being surrounded by such a soft, flush fabric while they take a snooze? Another pillow style bed, the Champ pillow is ideal for larger dogs and really lets your pup spread out while staying off the cold hard floor. The Arlee company also claims that the Champ is stuffed with more fiber filling than other conventional pillow beds on the market, and the company makes use of a unique baffled stuffer that helps keep the material from shifting around. This means that no matter how much Fido jumps or rolls around, he’ll never need to worry about the material spreading out and leaving a big old hole in the cushion. The lounge beds by P.L.A.Y. 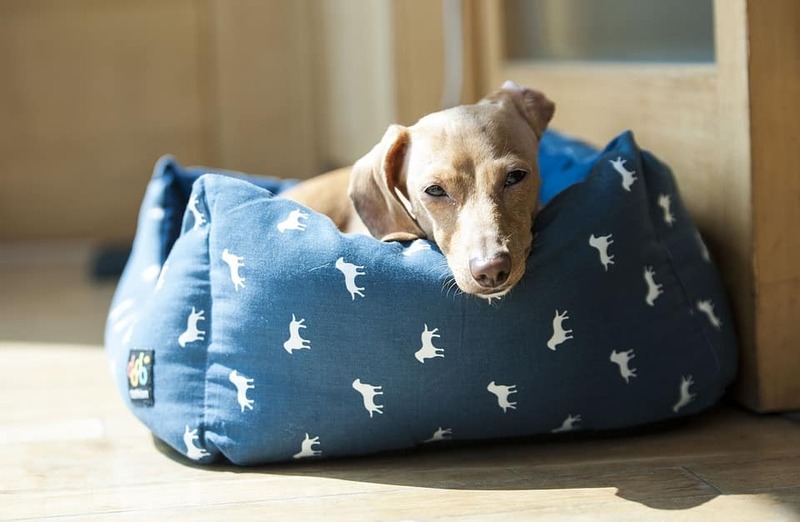 come in a variety of sizes to suit your pets needs, and are made of a high-quality woven houndstooth material to ensure your pooch is in the peak of comfort whenever he or she heads in for a nap. These beds are also machine washable and dryer friendly, and are stuffed with patented eco-friendly PlanetFill® filler, which is made from 100% post-consumer certified-safe recycled plastic bottles. 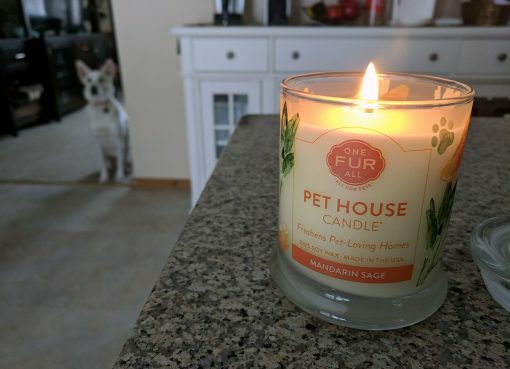 So now you can feel good about saving the environment and do something nice for your pup too! One thing that caught my eye about the P.L.A.Y. dog beds at the Global Pet Expo was their very fun dog bed prints and designs. These honestly look so cool I think they’d add style to any room in your home! Below is one of my favorite prints, the “La Folie”. Be One Breed makes a variety of high-quality dog beds and cat-retreats. The first dog bed I want to look at is the Cozy Bed! The cozy bed comes in three different sizes (small, medium, and large), and is filled with chopped memory foam, making it so comfortable that you might just want one for yourself too! The cozy bed also has an easy to clean, removable cover that you can toss right into the washer machine, and comes in a variety of unique colors and patterns to better blend in with the rest of your home’s décor. If your dog prefers a flatter surface, then the Diamond Bed might be right for you. The Diamond Bed has a stitched diamond pattern in the soft, microfiber cover. The cover is removable and washable and the base is memory foam. I would recommend this to any small to medium dog owners. Just like their owners, dogs need beds too. And while we might not realize it, dog beds can go a long way in providing much needed support for your four-legged friends bones and joints. 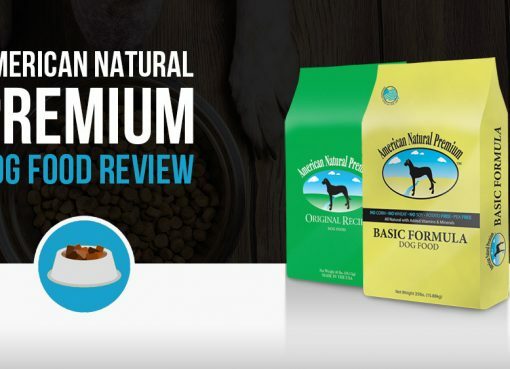 This is especially true for older or overweight dogs, or dogs who are prone to joint issues. After all, sleeping provides your pup’s body with a chance to heal, and having a comfortable, supported sleep can make all the difference when it comes to giving your pet the opportunity to recover from a long day of running around. But joint health isn’t the only reason that pet parents should invest in a good dog bed. Beds can provide your pet with a certain sense of safety and security, and in a sense a place they can call their own. Beds give our pets a place that they can retreat too when they feel scared and allows them to have a bit of space out of the way of the rest of the family. And not just that, but pet beds can actually also help dogs with shedding problems as well. Dogs that spend time in their beds naturally leave their hair behind where they lay, and keeping all that hair in one convenient place and away from the rest of the furniture only adds further incentive to get your pup a bed of his own! Dog beds, like human beds, come in a variety of makes and models, and it is important to try to find the one that best suits the needs of you and your pet. One of the first things that pet parents should take note of before selecting a new bed is how their dog sleeps. Does he prefer to sprawl out, or does he like to curl up in a ball? You should also make sure that you buy a bed that is appropriate for your pets size. Too small of a bed can be uncomfortable, and your dog might not even use it. And then, finally, shop within your budget and find what best matches the rest of your furniture. Those beds are going to be with you for a while, so you might as well make it fit in with the rest of your room’s style! Once you’ve figured all of that out, you can start looking at the actual material and bed-style to best suit your pooch. For pups that prefer to curl up when they sleep, pet parents might want to consider looking into the donut, or bolster dog beds. This design is also ideal for dogs who prefer to rest their head on something, or to lean against the wall for security, and their round or oval cup-like shapes also help to retain body heat and keep your fur-baby warm in the winter. For dogs that like to spread out, there are also pillow or cushion beds available. These beds, as their name suggests, look a lot like giant pillows, and provide a comfy pad that keeps your bed off the cold hard ground. Additionally, some pet owners like to opt for cot-style beds, especially if you have an outside dog. The sturdy frame of the cot-style beds makes them especially well suited for larger dogs, and their simple design makes cleaning a breeze. And for those who are looking to get fancy with their pup’s sleeping arrangements, pet parents can buy heated and even orthopedic mattresses. These beds are especially nice for older dogs who can use the extra support, but they great for dogs of all ages who are looking for a bit of luxury in their lives. For the most part, the same things that make a good dog bed are what also make a good human bed. Quality materials, a good size, and a soft cushion are all very important when it comes to what makes a good dog bed. The cushion should especially be tested, to make sure that your dog isn’t pressing down against the hard floor every time he or she lays down for a nap. That said, however, there are also a few other things to keep in mind when selecting that mutt mattress! The ability to clean a dog bed is crucial. Let’s face it – dogs can be messy, and accidents do happen. Because of this, you should always look for beds that can easily be tossed into the washing machine, or that have zippered covers that can get washed and tossed right back on. Additionally, being made of waterproof materials certainly helps too, and it avoids some of those nasty stains and smells that you might encounter from a bed made of a more absorbent fabric.